created, Twin Peaks has become a beloved cult favorite classic that continues to attract legions of passionate fans today. Twenty years after it first aired, the show's influence can be see in all areas of popular culture, from television shows and commercials, to comic books and video games, to films and song lyrics. The show has also impacted popular culinary traditions; there are Double R Diner copycat diners, pop-up dining experiences, doughnut-eating contests, and David Lynch's signature coffee. Now, fans hungry for a Twin Peaks fix can sate their appetite with this quirky cookbook that pays homage to the show. 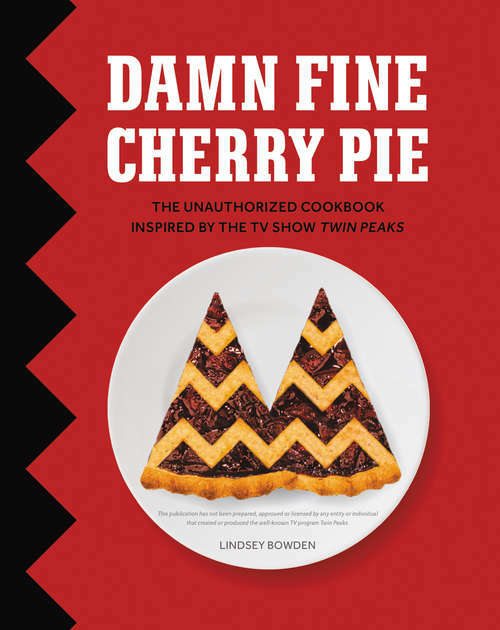 Lindsey Bowden, the founder of the Twin Peaks festival in the UK, has gathered dozens of recipes inspired by its most memorable scenes and characters, including Percolator Fish Supper, the Log Lady's Chocolate and Chestnut Roulade, and the Double R Diner's famous Cherry pie. Inside Damn Fine Cherry Pie you'll find delights such as:Coffee, Pastries & Donuts: Coffee with Mexican Chihuahua ChurrosDouble R Diner Menu: Percolate Fish SupperFamily Meals: Betty Brigg's Meatloaf and Doc Hayward's Diet LasagnaMeals on Wheels Program: Mrs. Tremond's Creamed Corn ChowderBlack Lodge Supper Club: Doctor Jacobi's Secret Coconut Hawaiian StewCocktails: Audrey Horne's Cherry TwistIdeal for viewing parties or a fun date night for two, Damn Fine Cherry Pie is a must for Twin Peaks fans, pop culture aficionados, and imaginative home cooks.